Chamfron Bellini won all her classes and took the youngstock championship at the Christmas show. Photo with thanks to Andy Thearle. An absolute credit to her owner Natalie Brougham. I have added a gallery onto the website to showcase Marks breaking and schooling services. Please don't hesitate to contact us if you would like to book your horse in for Spring/Summer 2015. New Page here - Breaking and Schooling. Colada has headed off to the Scottish Borders with Gemma Hope. She will be joining her half brother Chamfron Kukri who is now jumping BSJA. We've been thrilled to get fantastic updates and photos of him this year and look forward to seeing how Colada gets on. Morena has gone to Aberdeen with Julie Dey to join her Icelandic ponies. Chamfron Osito and the yearling Chamfron Perdita have been safely delivered to their new home in Cheshire with John and Bernadette Archer. Chamfron Firefly was Champion Appaloosa at the Howe Centre relaunch show at the end of October. Photo with kind permission of Sinclair Photography. That time of year again - Osito, Mojito, Milano and Nicobar are now geldings. Yearling Toledo has been delivered to his new home in Yorkshire with Cara Brooke. A lovely kind boy, he will make a super family horse hopefully with some eventing and hunting when he's older. Dora is the first foal of 2014 to leave us, she is heading off to Devon to join Rosena and Edmund Edge and her full brother Chamfron Morello. Looking forward to seeing her out showing. The Appaloosa Calendar produced by Anna Bloch is now out and includes Chamfron Hanami, Chamfron Morello and Chamfron By Dand... and quite a lot of sneaky Criollos too! Full sisters Chamfron Britannia and Chamfron Snow Goose were at the Scottish Appaloosa Breed show. Britannia owned by Rowena Kennedy won the two year old class and was second in the three year old and under sports horse class. Older sister Snow Goose owned by Chantelle Allanson was third in the three year old and under hunter class and fourth in the judges colour choice (leopard), three year old class and novice ridden. Absolutely thrilled to add the dun imported Uruguayan Criollo mare "Yaya Gaitan" to our broodmare band. She will be covered by Arrayan Numa early 2015. Chamfron Snow Goose owned by Chantelle Allanson was third in a strong in hand coloured class, won the youngstock class and was reserve champion at Stranraer Agricultural show. Immaculate as always! Photo with thanks to Baillie Photography. On the 13th of July Chamfron Kukri won the style jumping at the riding club area competition which qualified him for Blair. He also jumped clear in the team showjumping competition. On the 19th he was 3rd out of 26 in the Novice Working Hunter and 5th in the Open at St Boswells Show. Lysander has been delivered to Fiona Douglas in Northumberland where he will be brought on for long distance rides. Cactus has gone to his new home with Sarah Chadfield, a nice quiet youngster, this was as exciting as the introductions got! For the past six weeks we have had two Arrayan Numa fillies in for breaking and schooling. Bred by Border Reivers Polo Club out of the playing TB mare Caribbean Dream. Three year old Kitty (pictured) came to be broken in and four year old Lucia came for polo schooling. A really cracking pair of ponies. The four year old Chamfron Cactus Jack has come back home to be ridden away and then sold on. Chamfron Deja Vu has also moved home while staying in Yorkshire. 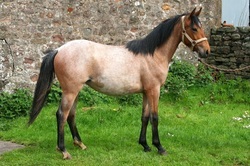 She is now owned by Jane Daly and has been bought with dressage in mind. On the 28th of June two of the Exbury Ghost youngsters were out showing. Rebecca Crump had Chamfron By Dand at Alyth show and won the ridden "any other breed" and the Championship in that section. 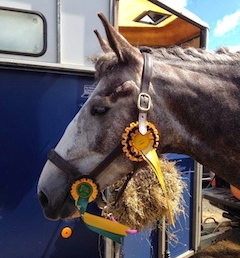 Kayreen Jones was third in the three year old sports horse class at Haddington show with Chamfron Angel Dust, qualifying for the SSH final at SNEC. 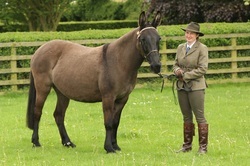 Yearling Chamfron Bellini had a very successful first outing winning three classes and taking the In Hand Championship. An absolute credit to her owner Natalie. 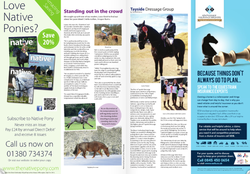 A small article in June's issue of Scottish Rider about our Criollo stallion Arrayan Numa. Chamfron Paloma is also gracing the cover of the June issue of WES magazine and Chamfron By Dand has been spotted in this months Endurance magazine. When we heard that Lamb Hill donkey show had kindly put on a specific mule class we thought it was time for Treacle to make her showing come back. Amazingly there were five mules forward and Treacle won the class, she thoroughly enjoyed her day out being admired. Chamfron Firefly had a good start to her 2014 showing season at Inchcoonan's spring show. She won the Hunter in hand and Reserve Champion in the Grass Routes section. 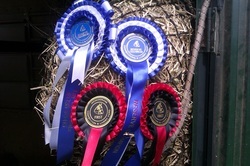 Followed by winning the youngstock class and Reserve Champion in the Hack/Riding horse section. 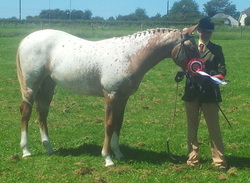 At her second outing, the Scottish Grass Sickness show she won the in hand youngster class. Three year old Chamfron Angel Dust has been back on the stud for four weeks for Mark to get her broken and ridden away. She has grown into a lovely sweet filly. Our lovely twin filly Perdita has been sold to John and Bernadette Archer but will stay with us until November as Chamfron Osito will be leaving with her when he is weaned. 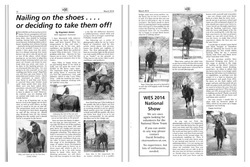 WES Newsletter issue 78 includes an article written by western riding instructor Kayreen Jones about Mark breaking in the Quarter Horse filly MH Driftwood Diamond. 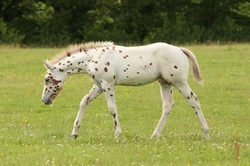 Early March saw Morello heading to Devon to join Rosena Edge's team of spotted show horses.